Information on Taima Hakubutsukan, including driving directions and opening hours, is available at http://www.facebook.com/taimamuseum. Botanists usually divide the cannabis family into three broad categories: tall cannabis sativa, bushy cannabis indica and small cannabis ruderalis. However, this simple taxonomy is often frustrated by the interfertility of these three types that allows them to be crossbred into limitless new varieties. The desired properties of these hybrids tend to determine the name by which they are commonly known. Marijuana, for example, usually refers to cannabis plants that are grown to be ingested for medical or recreational uses. Cannabis sativa is said to give users a feeling of energetic euphoria and can be prescribed for depression, whereas cannabis indica is apparently more sedating so can be used as a muscle relaxant or to treat chronic pain. Hemp is the name often applied to tall plants from the cannabis sativa category that are primarily grown for their strong fibers — but may also contain significant levels of THC. Most recently, the term industrial hemp has been coined in the U.S. to refer to cannabis plants that have been specially bred to contain very low levels of THC (less than 1 percent) in order to conform to current drug laws. 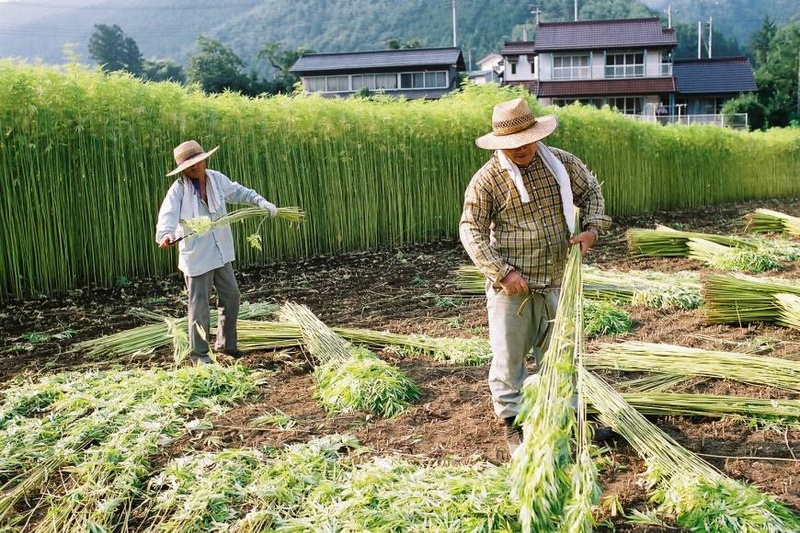 Today, many of Japan’s licensed cannabis farms grow a low-THC strain called Tochigi shiro that was first developed in the postwar period.